After a little bit of time off, we are back with another edition of Parental Guidance. If you haven’t read any of our past articles, the goal of this series is to help you find games to play with your family and friends outside of the usual gateway games (which you are already probably sick of). Once again we are going to take a look at three board games I chose to play with my parents during our latest gaming session. For these reviews, I’ll provide a quick summary of the game, followed by why I thought it would be a good choice for my non-gamer parents. My mother will then comment on what she thought of the game. 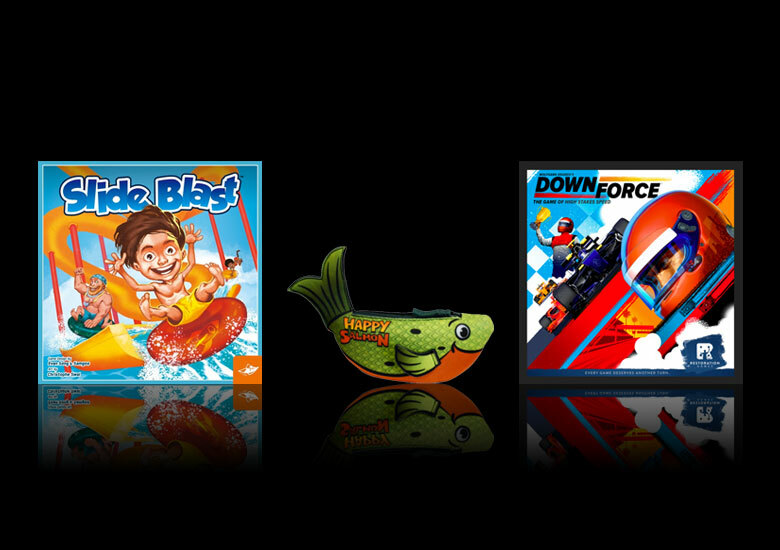 Slide Blast is a light tile-laying game with the goal being to create the longest water slide in the park. The rules are easy to teach: you choose from one of the two tiles in your hand and add it to the end of your slide. While it sounds very simple, there is actually a decent amount of strategy hidden in this little gem. One of my surprise hits from the year, Slide Blast is a great gateway tile-laying game. The rules are very easy to pick up and the theme is perfect for a family game. Knowing my mother’s love of tile laying games, I figured this would be an easy choice. In fact, I have lost count the number of people I’ve introduced Slide Blast to who have quickly bought a copy for their family game nights. I liked this game. It was a fun, quick, and simple game to play. Not much to the rules, so even if I don’t play this game too often, I’ll remember how to play without re-reading instructions, it’s that simple. I understood right away what I needed to do to win, but it was the first time I played, so I was too into building a long slide, that I didn’t try to place my tile in positions that would earn me tokens. I just went along and built a long straight water slide, so I lost! Next time I know better. The only downside to me is that there are a lot of slides going in different directions, so it’s not too easy to follow where your slide is going. How about making each slide a different color? Happy Salmon is a game that takes all of 30 seconds to explain how to play. The goal is to be the first person to play all of your cards. This is accomplished by looking around at the other players and finding someone with a matching card, you both have to then perform the action on the card. There are four actions in total: high 5, fist bump, switch places, and a happy salmon (a weird arm slapping kind of thing). Happy Salmon is a ridiculous game, bordering on stupid. Yet it always seems to evoke laughter and smiles from even the most skeptical of players. It’s loud, energetic, and quite unique. Knowing my nieces and nephews were going to pop by, I brought Happy Salmon along, figuring it’d be an easy family game with the group. This is a great game to keep on the coffee table to just pick up and play when you need a good laugh or to use as an icebreaker during parties. It’s also good when you’ve been sitting too long gaming and need to stretch and unwind. We had kids, adults, and older adults playing and everyone really got into it. Dad didn’t play but he was laughing just watching us. I also like the fish carry case. Published by Restoration games, their goal is to take long out of print games and breath new life into them. Downforce is a reimagining of Wolfgang Kramer’s Top Race game from 1996. The goal of the game is to earn the most money by racing your cars and betting on the winner. Cars are auctioned off at the start of the race and then moved around the track by all players using movement cards. Three times during the race, players will bet on which car they think will win. This one was a bit of a gamble as a selection because I knew the rules explanation would be a bit more than the parents were used to. However, I knew that once we got going, the gameplay was easy enough to pick up after a few rounds. While the theme isn’t exactly something they would normally gravitate towards, I figured the gameplay was enjoyable enough that wouldn’t matter. This one surprised me. I didn’t think I was going to like this game when Tony took it out of the box, and honestly, if I saw it in the store, I probably would not have bought it as I’m not into car racing. Turns out I enjoyed this game as you not only race your car along the track, but you place bets along the way. There was enough strategy to this game to make it interesting, but not overwhelming. The scoring was easy too. Selecting a card in your hand to move the cars along the track made it a lot more fun than using dice and relying on luck to move the cars.